The Columbia Gorge Discovery Center has opened a new Renewable Energy Exhibit. 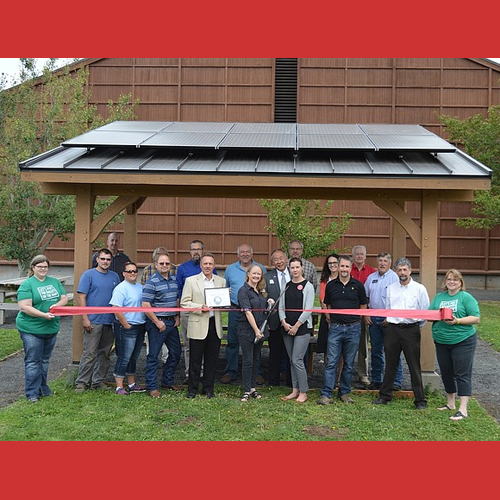 This exhibit was made possible due to a $50,000 grant provided by Google for the non-reflective solar panels and a $25,000 grant from Bonneville Environmental Foundation for an interactive exhibit in the museum to highlight renewable energy alternatives. Learn more about the Columbia Gorge Discovery Center's new Renewable Energy Exhibit below. Columbia Gorge Discovery Center partnered with the Delta Energy Club, which is composed of renewable energy students at Columbia Gorge Community College, to design and manage the project. This partnership helped students gain valuable skills that can be applied in the renewable energy sector. The solar panels are also accompanied by an exhibit where museum visitors can learn first-hand how renewable energy works and how it helps to reduce carbon emissions. “This is an excellent project that helps reduce carbon emissions, teaches students STEM (science, technology, engineering and math) skills in a hands-on way, and educates the community on the value of solar energy. We are pleased to support such a great project,” said Dave Karlson, site manager at The Dalles Google Data Center. Since 2008, Google has given more than $9 million to Oregon nonprofits.